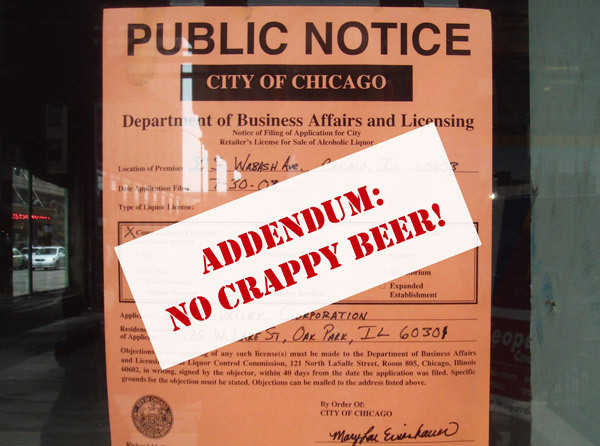 This is what every liquor license would look like if beer snobs ran the world. The Garden Gourmet, a grocery store in Chicago’s East Village, may be granted a liquor license that allows them to sell only craft beer and higher-end wine. No booze, no malt liquor, no fortified wines, no Budweiser. In other words, it’ll look like my garage, minus the wine. The measure is designed to address concerns in this mostly dry neighborhood that allowing beer, wine and liquor sales would create alcohol-fueled shenanigans. Members of the East Village Association voted 22-5 in favor of granting Garden Gourmet the restricted license, which should make the young urban professionals (you know, Yuppies) who shop at the store happy that they can get their Goose Island where they buy their Camembert cheese and their organic Belgian leeks. FULL STORY via Beer and Whiskey Bros.